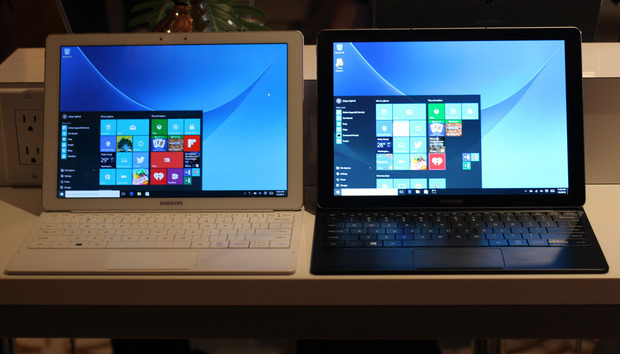 Samsung is making its first foray into Windows 10 tablets with the announcement of the new Galaxy TabPro S on Tuesday. It looks a lot like one of the company’s Android tablets, and features a thin, fan-less tablet powered by an Intel Core M processor. The TabPro S has both a front- and rear-facing camera, and can run the full version of Windows 10 Home or Windows 10 Pro. The world got an early glimpse of it earlier in the day on Tuesday after leaked images and specifications for the device hit the Internet. In an attempt to stand out from the crowd, Samsung has set the TabPro S up with a 12-inch Super AMOLED display, which means that Windows looks astonishingly good. Those looks don’t necessarily translate into performance, though: the preproduction unit that I spent time with seemed a bit less responsive than what I would expect from a tablet that’s looking to seriously compete with Microsoft’s Surface or Apple’s iPad. Samsung also unveiled a trio of features aimed at tying together the tablet and its latest smartphones. Users can tap their Galaxy S6 line or later smartphone on the corner of the TabPro S’s keyboard, and then use their fingerprint on their smartphone to unlock the tablet. Once it’s unlocked, the TabPro S will prompt users to switch on their phone’s hotspot feature to provide Internet access. While people are using it, they’ll be able to get access to push notifications from their smartphone so that they don’t miss out on key messages. A representative of the company said that the feature is aimed at connecting the firm’s Galaxy devices, so don’t expect to get push notifications from your Galaxy S6 on a Surface any time soon. People who want to use the TabPro S for serious work are going to run head-long into the tablet’s godawful bundled keyboard. In my limited hands-on time with the device, I found my fingers regularly mashed two keys at once because of its layout, and the limited key travel made it feel cheap. That’s why I’m concerned about the TabPro S — Samsung doesn’t seem to live up to the name of the device that it created. Despite the whiz-bang features and killer screen, it doesn’t feel like a professional-grade tablet. It’s not clear to me if consumers are willing to take a chance on a compromise-laden device. At this point, price will likely be the deciding factor in how good a deal the TabPro S is. It feels like an awesome offering for the $500 to $700 range, but it’s not going to run circles around something like the iPad Pro or Surface Pro 4. Should Samsung sell it cheaply enough, it may be able to find some traction in the market, but my hopes aren’t up for that just yet. Samsung may go on to prove me wrong. The company is known for taking an imperfect first version of a product and continuing to iterate it until it actually finds traction in the market, which means that the TabPro S2 (or whatever Samsung decides to call it) may be a marked improvement over the original.